TeamCity features backup and restore options, which let you save your system's state and restore it when it is needed. Starting from TeamCity 9.0, project import has also been added, which lets you rearrange projects among servers: you can transfer projects with all their data (settings, builds and changes history, etc. ), as well as your TeamCity user accounts, from one server to another. 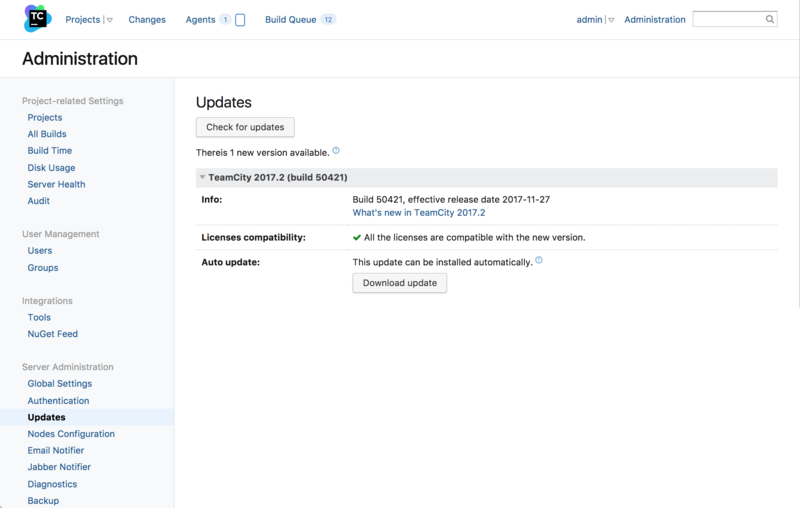 TeamCity detects a new version when it comes out and notifies the system administrator. It provides a list of possible options, checks your license compatibility, and lets you download the distribution package and perform the auto-upgrade. Builds produce logs and artifacts, which occupy disk space on the server. Disk Usage report gives you a clear view of how much space each project takes up, as well as insights on builds with unusually large build logs or artifacts. 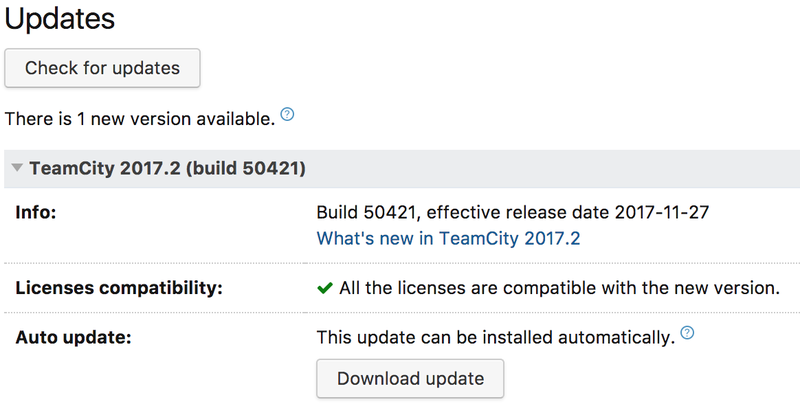 TeamCity keeps a history of builds with their artifacts and other data. To limit the number of builds kept in the history, you can define a cleanup policy for each project or configuration. Starting from TeamCity 9.0 the data cleanup runs in a background, according to the configured policies. Similarly to the Disk usage, you can see how many resources are taken up by a project with its subprojects. Further drilling down is also possible. 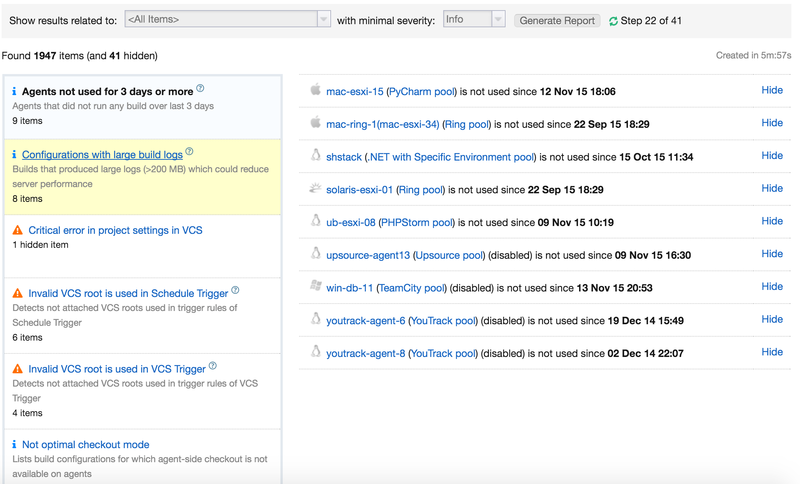 TeamCity is equipped with a central place where you can monitor the state of your build server. 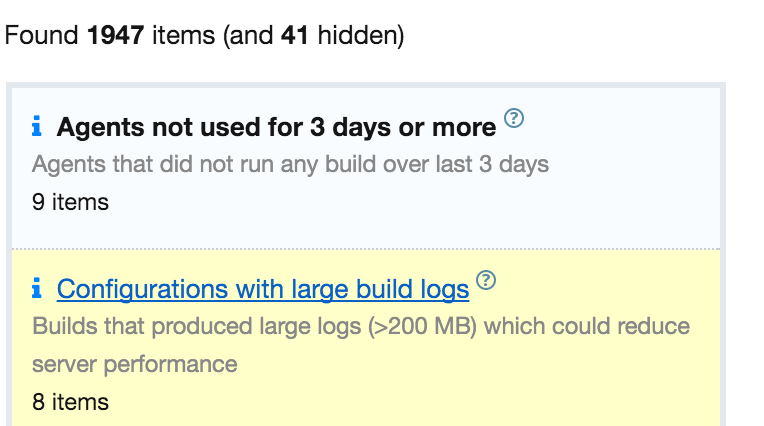 There you can easily spot different configuration problems: redundant or unused VCS roots, build configurations with large build logs, critical errors, etc.